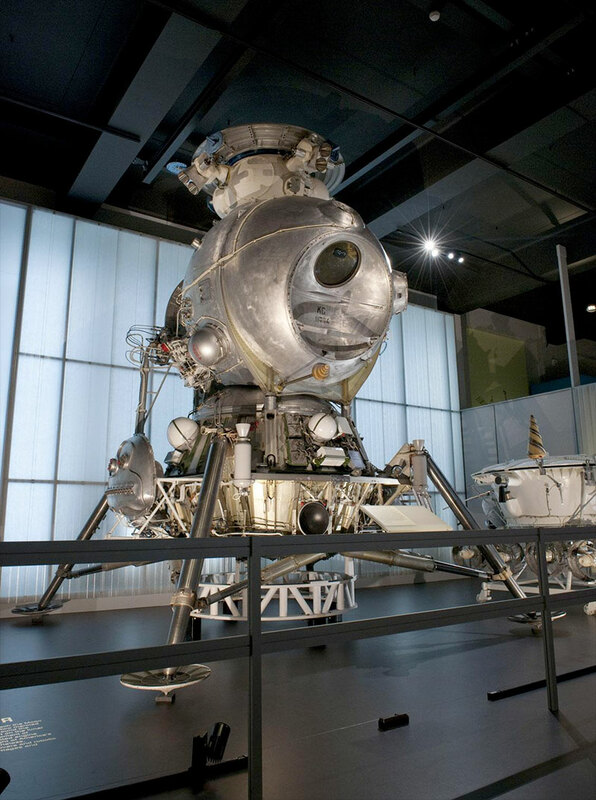 – The capsule that launched the first woman into space, the most complete Soviet lunar lander still in existence and the 80-year-old original drawings of a Russian rocket pioneer are among the more than 150 rare Soviet-era space relics now on display in London. 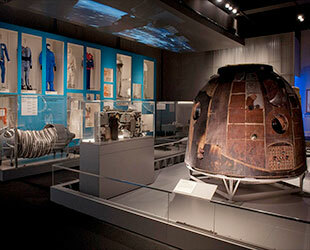 Billed as the greatest exhibition of Soviet spacecraft and artifacts ever to be seen outside of Russia, "Cosmonauts: Birth of the Space Age" opened to the public Friday (Sept. 18) at the Science Museum in South Kensington. Years in the making, the unprecedented exhibition is the result of a partnership between the museum, the State Museum and Exhibition Center Rosizo in Moscow and Russia's Federal Space Agency Roscosmos. 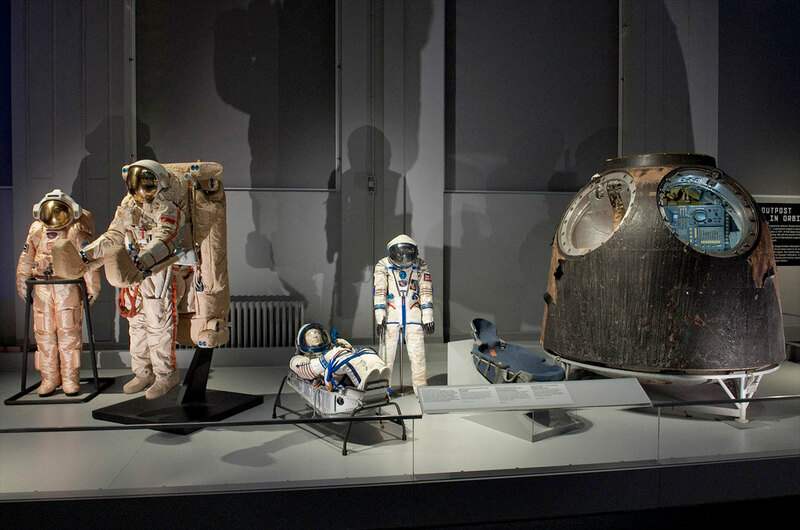 "'Cosmonauts' is a once-in-a-lifetime exhibition that has taken years of dedication and skill to make a reality," said Ian Blatchford, the director of the Science Museum. "The Russian space program is one of the great intellectual, scientific and engineering successes of the 20th century and I am thrilled that we have been able to bring together such an outstanding collection of Russian space artifacts to celebrate these achievements." In 1957, the Soviet Union initiated the space age with the launch of the world's first satellite. Following the success of Sputnik, the country launched the first animal, man and woman into orbit — all within six years. "Our work in space is inspired by the bravery of [first man in space] Yuri Gagarin, Valentina Tereshkova and the first cosmonauts," said Russian cosmonaut Mikhail Kornienko in a video sent down from the International Space Station. "We hope you will enjoy discovering how they made space travel a reality." 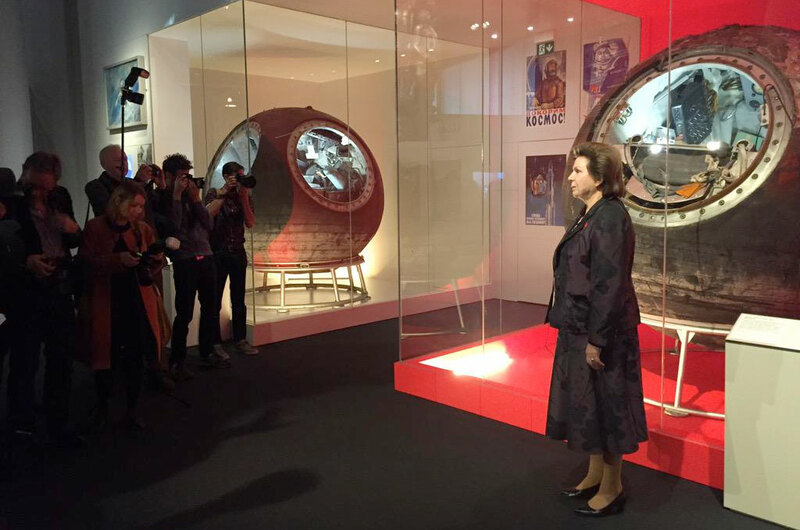 "In this new exhibition, you can see Tereshkova's Vostok 6 capsule, a moon lander and much more," he said. Tereshkova became the first woman to travel to space on June 16, 1963. She came to the Science Museum to help launch the new gallery on Thursday (Sept. 17). "I believe this exhibit shows how interesting and important for mankind is the work of people both on the ground and in space," Tereshkova stated. "It creates the possibility to think about future cooperation between our scientists [and] our young people who want to fly into space." 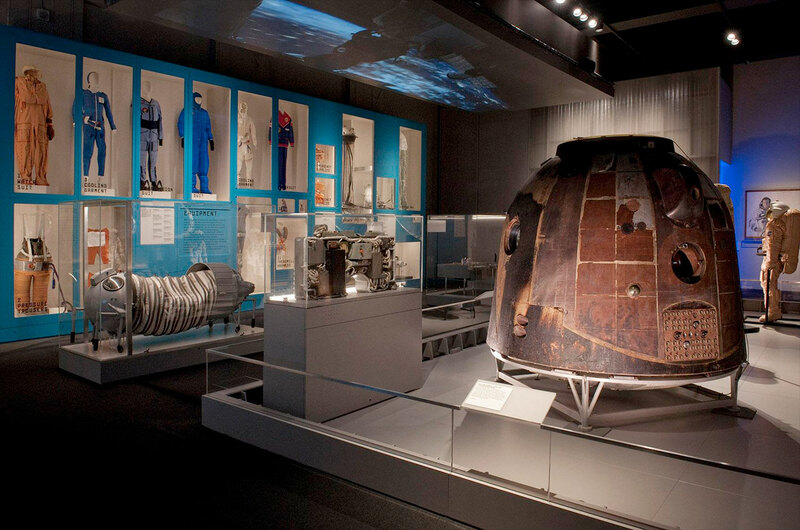 For decades, Tereshkova's Vostok 6 capsule has been on display in the private museum of its builder, Rocket and Space Corporation (RSC) Energia, located near Moscow. 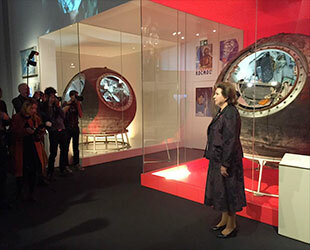 The opening of "Cosmonauts" offered the opportunity for Tereshkova to be reunited with the spacecraft that carried her for 48 revolutions around the Earth. "I look at [the capsule] with love because it allowed me to work successfully for over three days in orbit," she said. 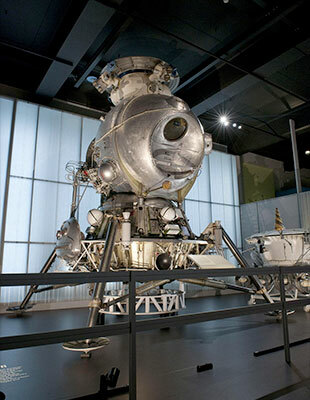 Another of the exhibition's featured relics is the 16-foot-tall (5 m) LK-3 lunar lander. Built in 1969, it was designed to take a single cosmonaut to the surface of the moon. Kept secret for two decades, this lunar lander was declassified especially for "Cosmonauts," according to the museum. "The lunar lander you have here was used as a training model at the cosmonaut training center," explained Alexei Leonov, who made the world's first spacewalk in 1965 and had been slated to fly to the moon had the LK program not been cancelled in the wake of rocket failures and the U.S. Apollo astronauts getting there first. "Londoners, visitors to the museum, will be able to see it all as it happened in our country [and] see it with their own eyes," said Leonov during a visit to the Science Museum in May. "These are the objects that with the help of which we conquered space, step by step." "Cosmonauts" covers the full history of the Russian space efforts, from rocket pioneer Konstantin Tsiolkovsky's 1933 drawings depicting weightlessness and life in orbit almost 30 years before spaceflight would become a reality to an original engineering model of Sputnik, through an ejector seat and suit used to launch the first dogs into space to a space toilet, shower and other space equipment that were designed to help cosmonauts living aboard the Mir space station. The exhibition also showcases a rarely-seen collection of original Soviet space poster art, which fixed the image of the cosmonaut in the minds of the Russian people. "We are borrowing things that that our Russian colleagues really do think of as their crown jewels — and almost none have ever left Russia," said Blatchford. "Cosmonauts" is open now through March 13, 2016 at the Science Museum, London. Tickets run £14 (about $22) for adults; children under 7 are free of charge. 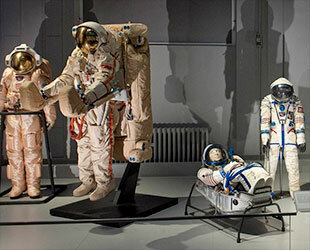 For more details about the exhibition, "Cosmonauts: Birth of the Space Age," see the Science Museum's website.